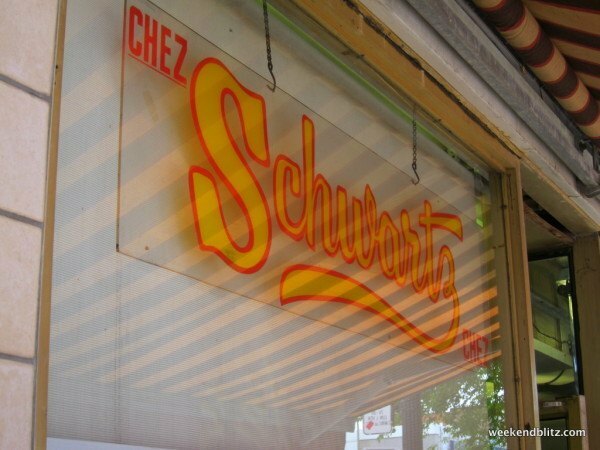 The first time an over-hyped restaurant delivered over and above the already highly set bar. 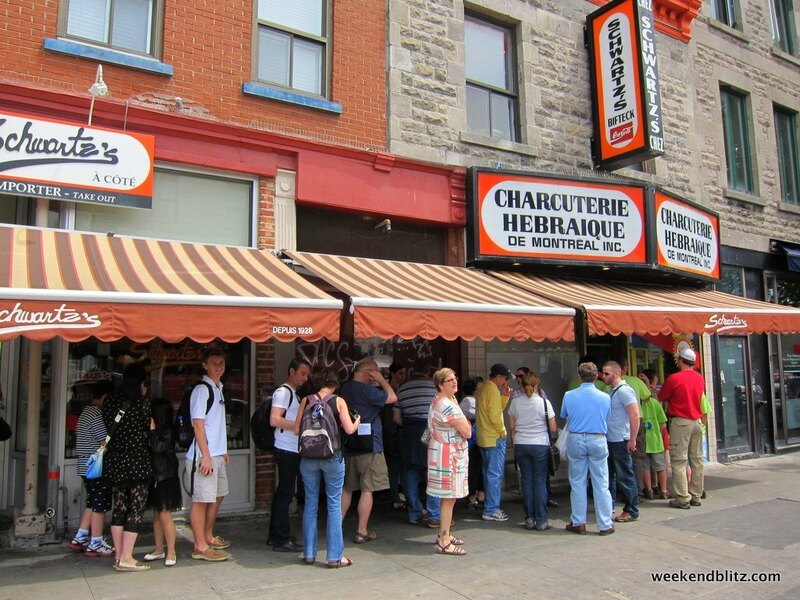 If you've got just 1 meal in Montreal, this should be it. $-$$ – Appx 15 CAD for 2 people. Without fail, everything we read pointed us to Schwartz’s Deli, as the must-try restaurant in Montreal. 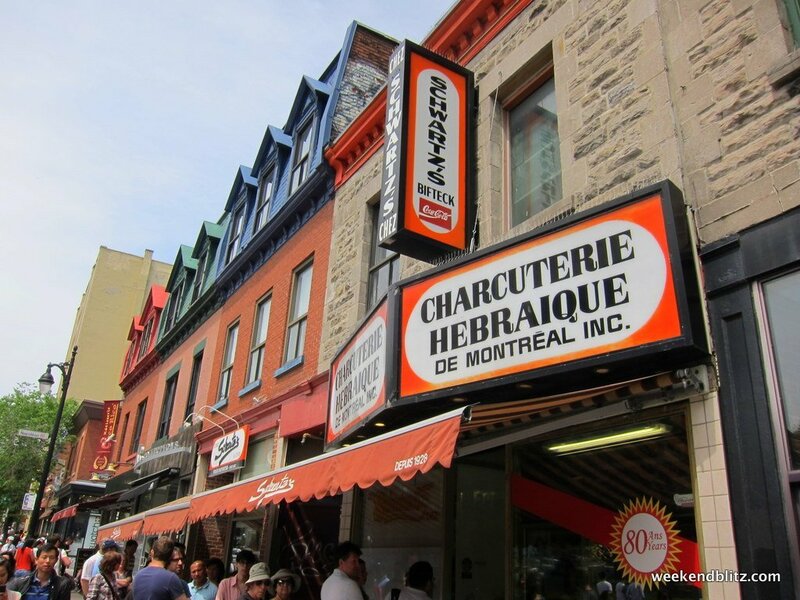 Sure enough, when we walked up to the deli, the line was wrapped along the outside of the building, but moved surprisingly fast – we were seated in less than 10 minutes. So, don’t let that long line fool you into giving up. We got lucky and were seated at the only two-seater table, in the very back of the restaurant. 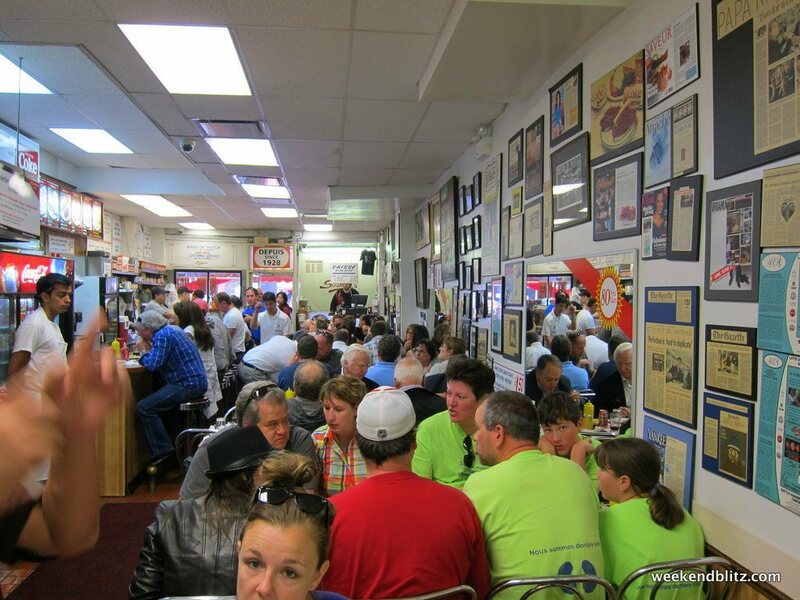 Every other table in the small restaurant sat eight people, and different sized parties were suddenly eating elbow-to-elbow. 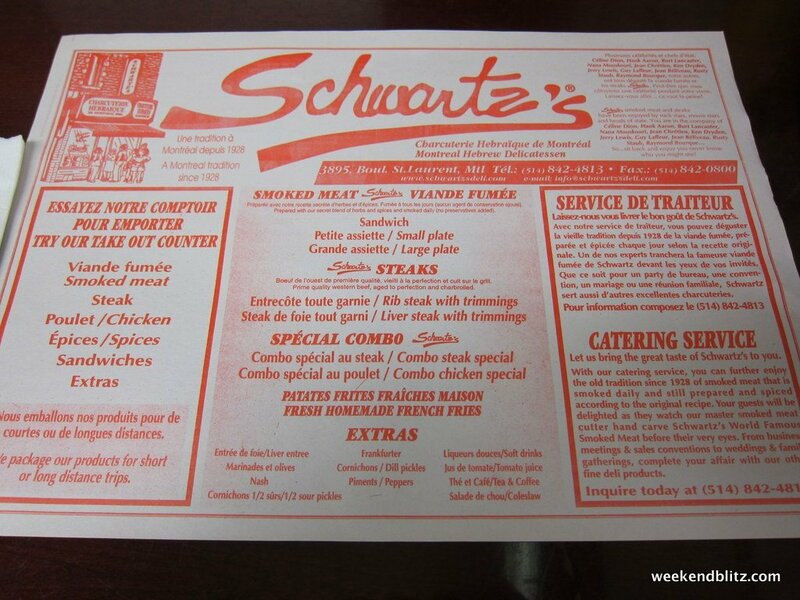 After reading on the menu that celebrities ranging from Hank Aaron to Celine Dion had eaten at Schwartz’s, we soon realized that all the talk must be true. So, we ordered the LARGE PLATE OF SMOKED MEAT ($13.95). The waiter told us that’d be plenty for two (and we found out when we got the bill that there’s a $1.50 surcharge for splitting), and we chose the “medium” (recommended for first-timers) when given the choice between lean, medium or fatty meat. 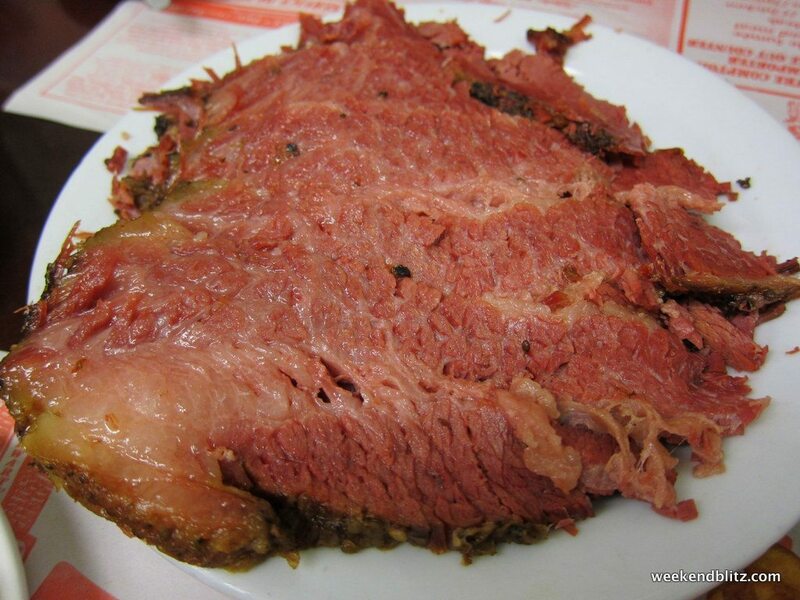 The meat arrived pretty shortly thereafter – a huge plate of corned beef slices – so juicy you could just see the flavor oozing out of it. 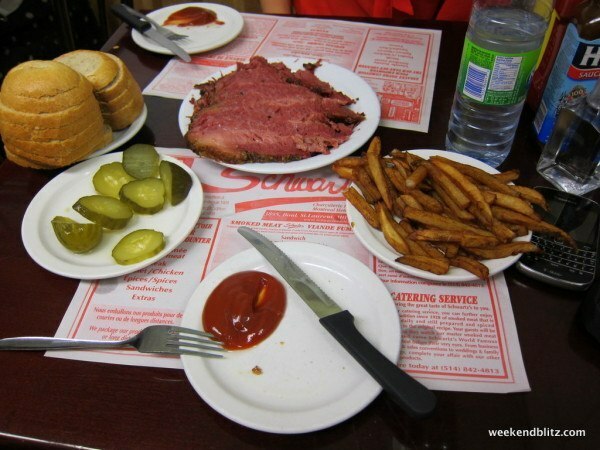 A plate of rye bread also arrived, along with the SMALL FRIES ($2.80) and SWEET-AND-SOUR PICKLE ($?? ), sides the waiter suggested. 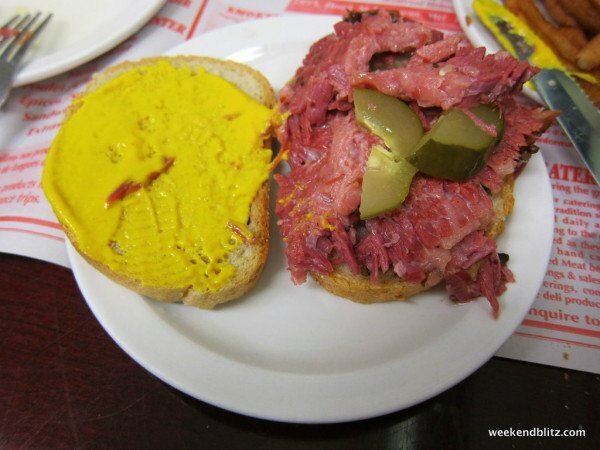 We watched as two men who seemed like locals, seated at the next table, squirted plenty of mustard on their bread and make sandwiches, and we did the same, adding a few slices of pickle. The meat was so tender, moist and salty. And, even though the plate of meat seemed so big at first, we finished off every bite of the smoky meat. 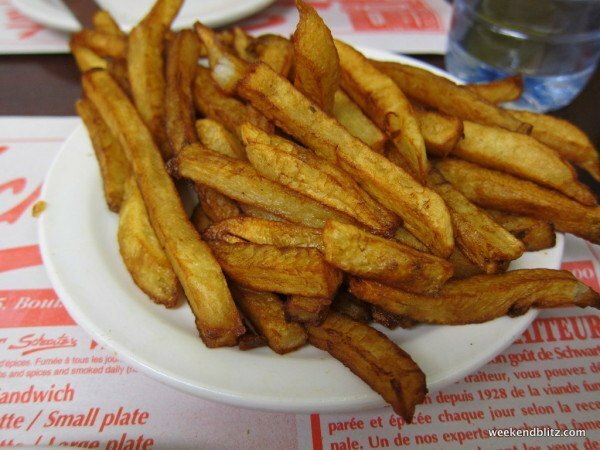 The fries were freshly cut potatoes that seemed to have been fried just minutes before they were delivered to our table. The pickle was huge, thick and super salty. Pretty typical sides, but it doesn’t really matter because the meat stole the show, hands down. So far, our best meal in Montreal yet. And that’s saying something. 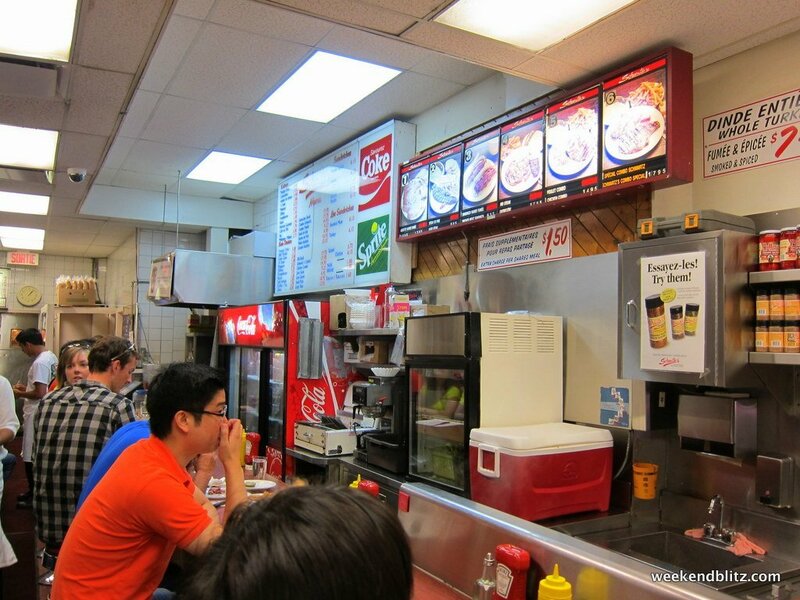 But, what seems to be a cheap deli adds up fast, and be prepared to pay only cash, as they don’t accept credit cards. BOTTOM LINE: The first time an over-hyped restaurant delivered over and above the already highly set bar. If you’ve got just 1 meal in Montreal, this should be it.